The first step is applying online. Get started now! For helpful hints during the job seeking process and instructions on how to apply for jobs at DOC, visit the How to Apply webpage. Minimum Qualifications Screening – Once we receive your application, we'll screen for the minimum required qualifications based on your responses to the supplemental questions. Application Review – Application materials will be assessed in order to determine top candidates. Interviews – Typically, you'll interview with a panel of at least three current Department staff. You’ll be provided with further details about the position you’ve applied for and information about the division and agency as a whole. You’ll have the opportunity to cover things like your employment history, accomplishments, and qualifications. You’ll also be asked some technical skills questions related to the job and situational and behavioral based questions to assess your aptitude for corrections. If time permits, you may be given a tour of the office you've applied to. Reference Checks – If you are a top candidate after the interviews, we'll contact both current and former supervisors and/or professional associates to gauge your past performance in a professional work environment. This is a policy requirement, so please be prepared to provide at least 3 professional references. Criminal History Check – If you are a top candidate, you will have a criminal history check completed. 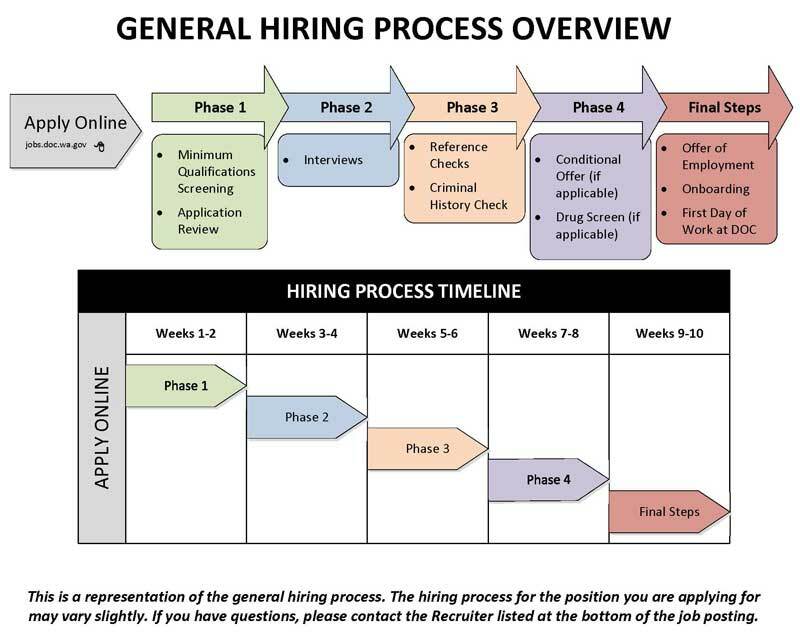 Conditional Offer (if applicable) – If you have successfully completed all of the previous steps, and the position you’ve applied for requires a pre-employment drug screening, you will be offered a position contingent upon the pre-employment drug screening and Appointing Authority approval. The results of all completed assessment steps will be presented to the hiring authority for a final determination. The top candidate(s) will be officially offered an opportunity for a rewarding career with the Washington State Department of Corrections. On your first day, you can expect a standard orientation, paper work, online training and a tour. Qualifications Screening – Once we receive your application, we will conduct an initial screening to ensure you meet the minimum required qualifications. In cases where there are a large number of applicants, your responses to the Supplemental Questions may be used for additional screening in order to narrow down the first round candidate pool. Invitation to Hiring Event – During the Correctional Officer Hiring Event you will be given a brief presentation about DOC, the facility you've applied to, along with further details about the job. Afterwards, you will have the opportunity to interview for the position. Hiring Event – The Hiring Event interviews are conducted by a panel of facility staff and local Human Resource staff. 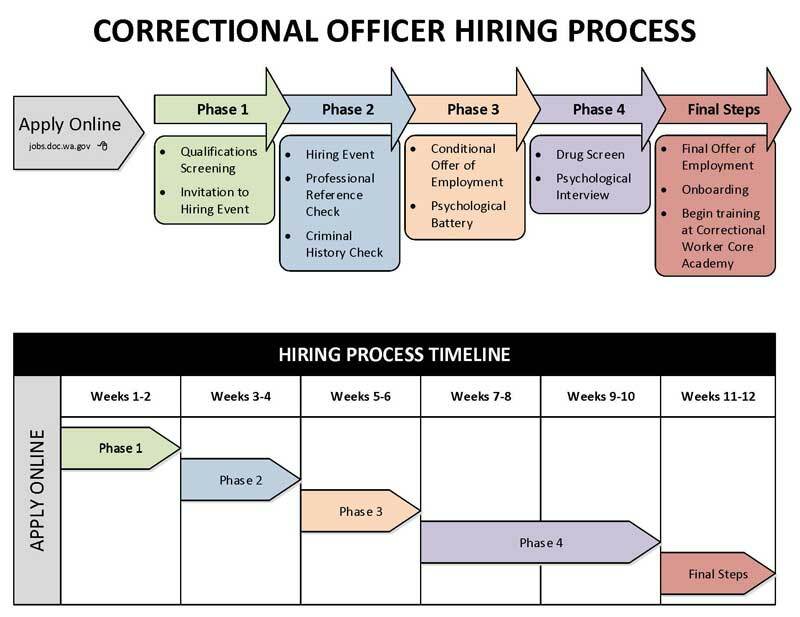 They will ask questions in regards to your experience and employment history, as well as behavioral and competency based questions intended to assess your aptitude for working in a corrections environment. Professional Reference Checks – If you are a top candidate after the interviews, we will contact both current and former supervisors and/or professional associates to gauge your performance in a professional work environment. This is a requirement, so please be prepared to provide at least three (3) Professional References*, to include current contact phone number and email addresses. *A Professional Reference is defined as an individual who has been paid to supervise your work and can attest to your work performance, technical skills, and job competencies. If you do not have any or sufficient professional references, please include non-related professionals, such as educators or other professional associates. Criminal History Check – Candidates who are successful during the interviews will be subject to a background/criminal history check. This is needed in order to obtain clearance on facility grounds, if hired. During the Hiring Event, you will be asked to complete the forms necessary to conduct a criminal history. The Conditional Job Offer – If you have successfully completed all of the previous steps, you will receive a conditional offer of employment, contingent upon successfully completing a number of required activities, including a series psychological exams (psych battery), a pre-employment drug screen, and a psychological interview. Psychological Battery – The Psychological Battery is a series of three (3) exams. The results from these exams will be reviewed at a later date by one of our Staff Psychologists. The psychological battery is intended to ensure that you have the mental conditioning necessary to succeed as a Correctional Officer. Pre-Employment Drug Screening – Candidates who have advanced to the fourth phase of the selection process will be required to complete a pre-employment drug screen. Psychological Interview – In the last phase of the selection process, candidates attend a pre-scheduled interview with one of our Staff Psychologist. During this 1-hour meeting, the psychologist will review your responses from the psychological battery exams and ask additional behavior based and job related questions in order to assess your psychological competencies and mental conditioning. The results from all completed assessment steps will be presented to the hiring authority for review and final selection. The top candidates will be officially offered the opportunity to begin a rewarding career with the Washington State Department of Corrections. You will then be scheduled for an orientation at the facility (standard paper work, online training, and uniform fitting). And finally, you will begin your six weeks of paid training at the Correctional Worker Core (CWC) Academy. The work of a Corrections Officer, and the required training can be physically demanding at times. Click Here (pdf) for a description of the training you’ll receive and the associated requirements. The CWC Academy will prepare you for success in your new role as a Correctional Officer! Minimum Qualifications Screening – Once we receive your application, we'll screen for the minimum required qualifications based on your responses to the supplemental questions. As long as you meet the minimum qualifications for the position, and have attached all of the required documents (i.e. cover letter and/or resume) you'll move forward to the next step in our selection process. Subject Matter Expert Review – Your application materials may also be reviewed by a Subject Matter Expert (SME). The SME will assess your education, training, and experience as it relates to the job, in order to determine the top candidates to move forward in the process. Interviews – You'll interview with a panel of at least three current Department staff and/or community stakeholders. You’ll be provided with further details about the position you’ve applied for and information about the division and agency as a whole. You’ll have the opportunity to cover things like your employment history, career goals, and qualifications. You’ll also be asked some technical skills questions related to the job and situational and behavioral based questions to assess your aptitude for corrections. If time permits, you may be given a tour of the office you've applied to. The results of all completed assessment steps will be presented to the hiring authority for a final determination. The top candidates will be officially offered an opportunity for a rewarding career with the Washington State Department of Corrections. On your first day, you can expect a standard orientation, paper work, online training and a tour. Upon employment, you will be scheduled for two paid trainings. 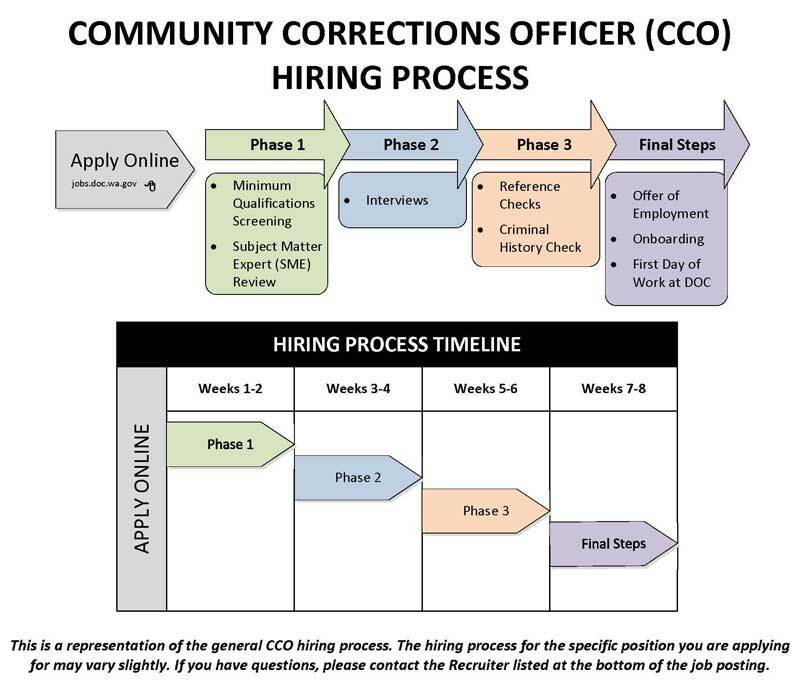 A one (1) week New Employee Orientation, as well as a three week Community Corrections Officer Academy (CCOA) to prepare you to be a successful Community Corrections Officer. The work of a Community Corrections Officer, and the required training can be physically demanding at times. Click Here (pdf) for a description of the training you’ll receive and the associated requirements. Per policy, CCOA must be completed within six (6) months of your hire date. Additionally, if you elect to be armed, you may also request to attend a one week Community Corrections Division Firearms Academy if you have successfully completed the three prerequisites: Completion of CCOA, Use of Force Academy, and Oleoresium Capsicum (OC) Certification.